Northwestern University’s Sybil Madison has been named to the Civic Leadership Academy at the University of Chicago’s Harris School of Public Policy, a program for promising leaders in non-profit organizations and local government agencies within Chicago and Cook County. 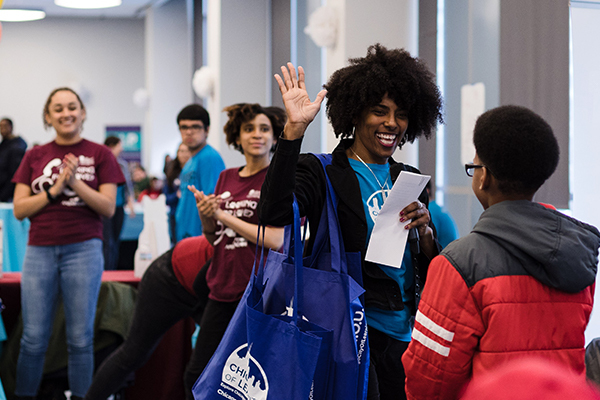 Madison, a research associate at the School of Education and Social Policy, is director of the Chicago City of Learning Initiative for the Digital Youth Network, a program of Northwestern’s Office for Community Education Partnerships. Her expertise lies in leading collaborative efforts to reform and reimagine teaching, learning, and education, particularly in the service of under-served communities. For the past 20 years, this work has been in partnership with school district administrators, principals, teachers, social workers, and youth, as well as with government and civic institutions and leaders. A clinical and community psychologist by training, Madison has leveraged her academic training to help translate research into practice in urban schools and communities. Prior to her focused school-based work, Madison was a research assistant professor at the University of Illinois at Chicago. In that capacity, she trained clinical psychologists and social workers, conducted applied and preventive research, provided clinical interventions to children and families, conducted qualitative classroom-based research, and developed school, family, and community-based collaborative approaches to HIV prevention. The 30 new fellows, who represent the City of Chicago, Cook County, and citywide and community-based nonprofit organizations, were introduced at a ceremony at Venue SIX10 in Chicago that featured Mayor Rahm Emanuel as the keynote speaker. The fellows will begin a rigorous six-month program that will teach essential leadership skills and give them the time and space to focus on a specific leadership skill that benefits their work. In March, the fellows will travel to the University of Chicago Center in Delhi, India, for a weeklong global practicum. While there are many leadership development programs for the private sector, opportunities specifically designed for nonprofit and government leaders are rare but necessary. Madison received her bachelor's degree in psychology, with honors, from the University of North Carolina at Chapel Hill and her doctorate in Clinical Psychology, with a focus on Community Psychology, from the University of California at Berkeley.